1. My ultimate parachute is of a supernatural kind. So although a physical chute is attached to me, the hand of God is really the thing that holds me. 3. To the soldiers of my unit: “I will not only pray for you, I will jump out with you!” Your chaplain literally have wings. 4. I’m suffering from a bout of bacterial infection on my nose just at the conclusion of my four grueling courses this semester and just at the beginning of Airborne school. The pain was unbearable. It was the most painful, most annoying thing I’ve ever felt in the most recent past. It pulsated constantly and radiated to my left eye, temple and jaw. Imagine a grown man tossing in bed at 2 am whining and moaning like one of his little girls. A 1600-mg Motrin dose did allow me to maintain my sanity. But then it lasted only for four hours. My liver will definitely be paying for this! The point of all this is that God is in control even that of one’s death. He is the One who made your appointment. We don’t plan on it, sure; and we avoid any risk of dying. Is there a great risk of dying by cause of parachuting out of planes? Sure. Is there a risk of dying from a nasty bacterial infection? I wonder if this risk is not greater. People get it everyday. I’m only privileged to train for airborne. Not a whole of people get to do that. 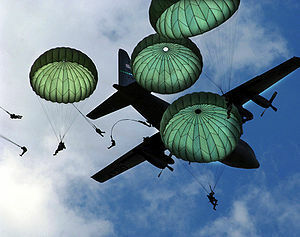 So I go to Fort Benning, GA. And Airborne school, here I come!